Enough of the whining, you’ve read it before, no sense in dragging it on. In the studio you will see that the joey is almost finished and I couldn’t resist placing him in the pouch temporarily just to see whether they look good together…the answer is yes!!! 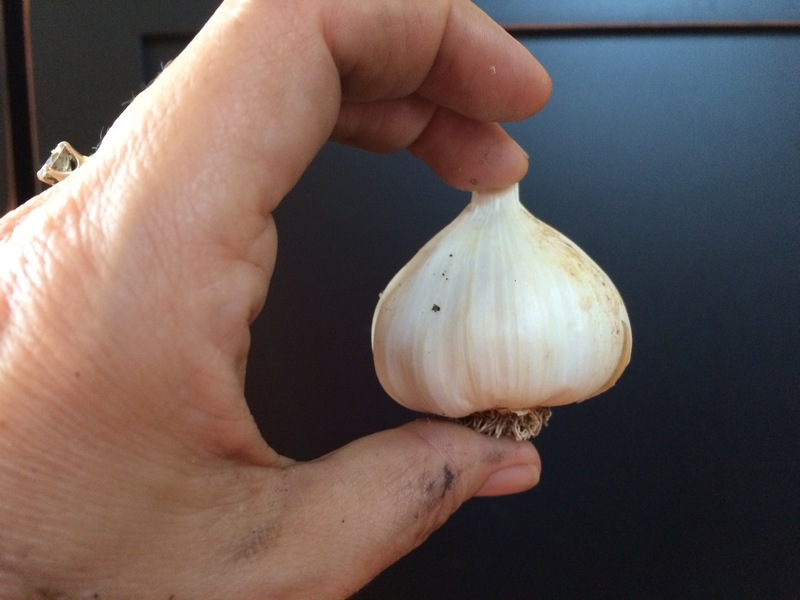 I won’t tell you why, but earlier today I could be seen taking a picture of a bulb of garlic. You will just have to be patient to find out why. 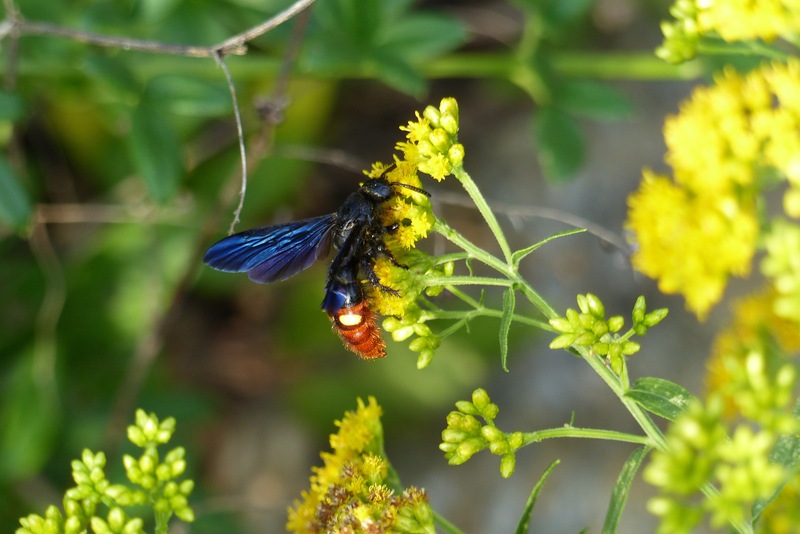 In the garden you will see a late pollinator called a digger wasp or blue winged wasp on the native goldenrod. 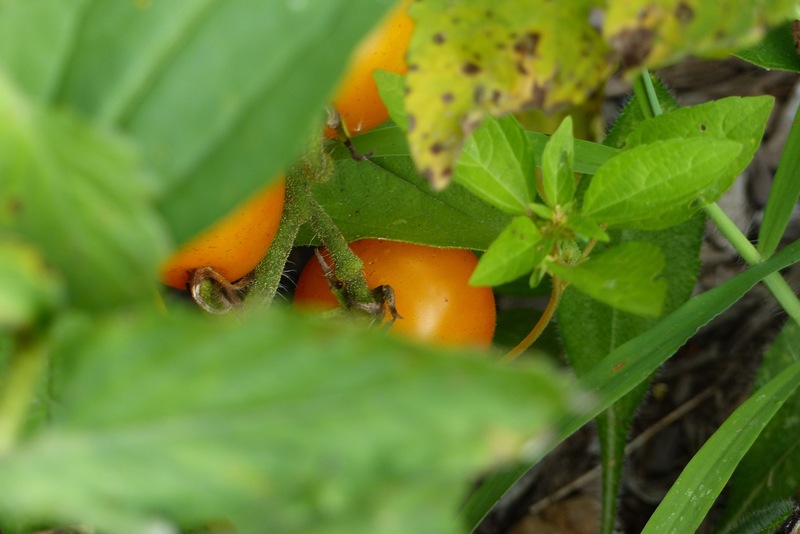 I was thrilled to see it for more than one reason, not only is it cool looking but the mothers feed on Japanese Beetle grubs…I hope they eat lots of them during the winter. They made a mess of my garden this year. 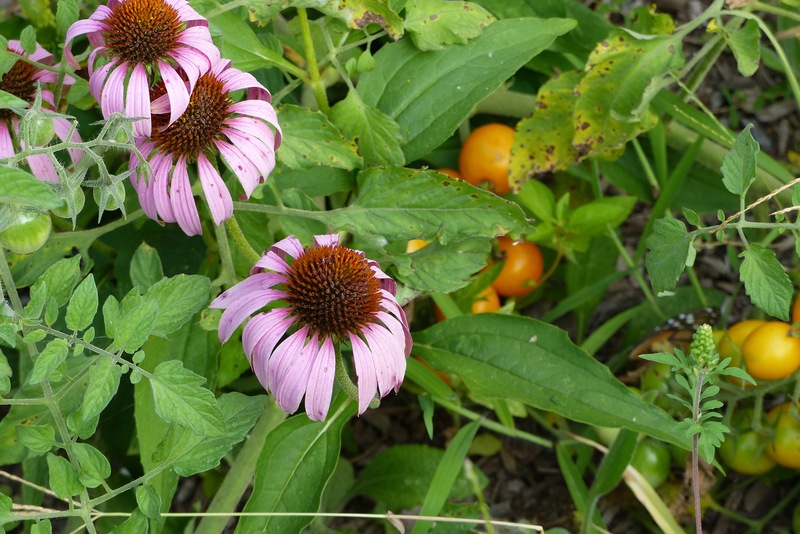 Otherwhere’s in the garden, a volunteer yellow cherry tomato is hiding under the echinacea…I just picked some and have yet to eat one but will report in a future post, if I remember. And finally, here is proof that at least one monarch visited my garden this year. I had a whole bunch of tomatoes in my hands so I didn’t dig around for the fourth wing. One can only hope that the eventual death of this butterfly happened after the eggs were laid for the next round. Lovely post! Hope you’re feeling more grounded…love the joey! Thanks Charlie. I am actually feeling a bit better now, I just hate those days when being a useful member of society is not an option. It seems like such a waste sometimes. 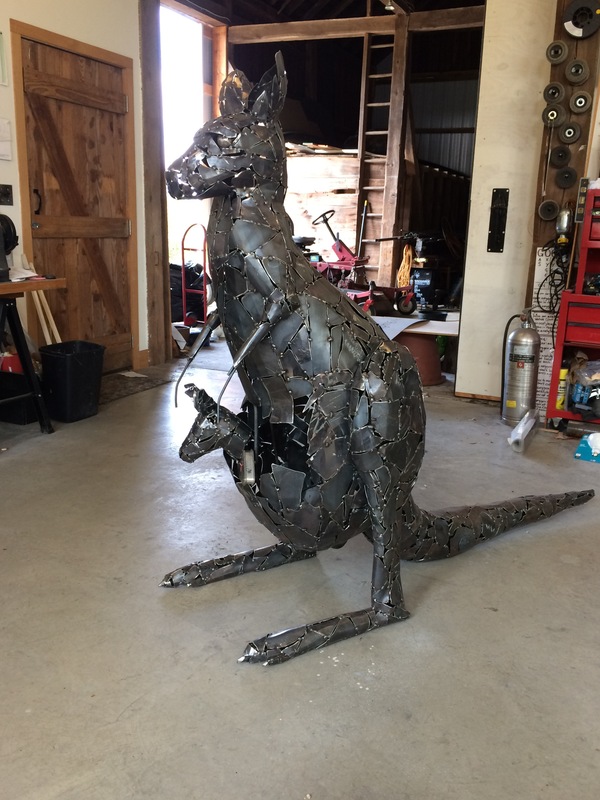 thanks for the feedback on the roo, I think of you often while I am making it…your pix definitely help! Still need to fix the feet though. 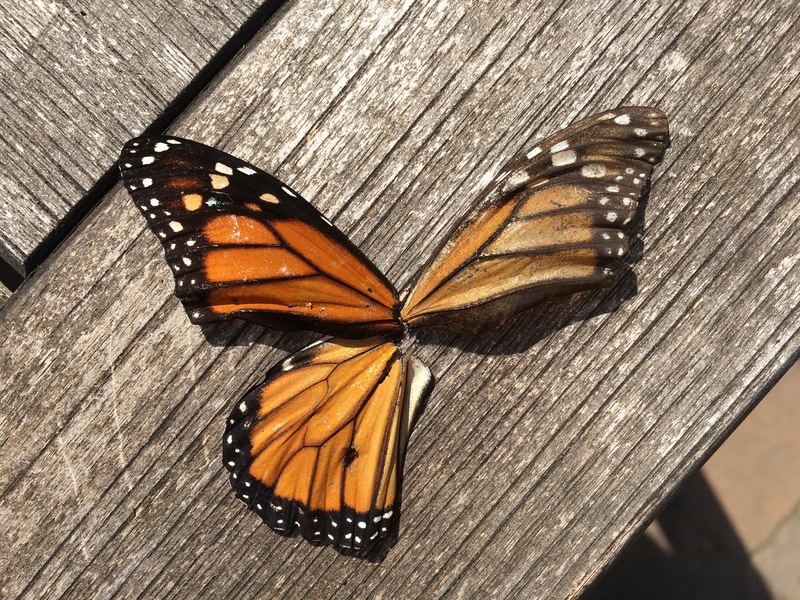 Nice walk through your late summer goings on – I too hope that monarch laid some eggs before it’s demise. Haven’t seen a one this year in spite of lots of milkweed😒. Hope you’re out of the molasses! I am out of the molasses which is a good thing. My gardener tells me that the monarch was probably the victim of a praying mantis which is notorious for picking the wings off the body before it eats it. Molasses! Apt word from a pastry chef. 😉 Glad you haven’t gotten stuck in it, after all. And hooray for the blue winged wasp, and Mother and Joey reunited.